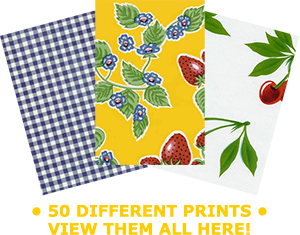 We offer almost 50 different oilcloth fabrics by the yard and in our products. The creative possibilities for working with oilcloth are endless, as oilcloth is durable, easy to care for and quick to clean up. Other oilcloth fabric prints and colors may be available upon request.